Lonely Planet: The world's leading travel guide publisher Discover the freedom of open roads while touring Italy with Lonely Planet's Italy's Best Trips, your passport to up-to-date advice on uniquely encountering Italy via l'auto. 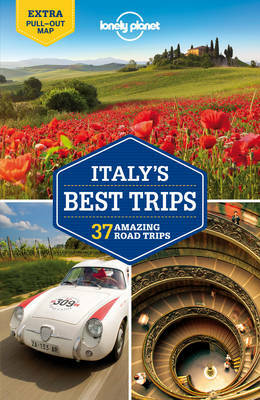 Featuring 38 amazing road trips, from 2-day escapes to 2-week adventures, you can weave along the precarious Amalfi Coast or relish a sunny drive in Tuscan hills, all with your trusted travel companion. Get to Italy, rent a car, and hit the road! Inside Lonely Planet's Italy's Best Trips: *Lavish colour and gorgeous photography throughout *Itineraries and planning advice to pick the right tailored routes for your needs and interests *Get around easily - 46 easy-to-read, full-colour route maps, detailed directions *Free, convenient pull-out Italy road map (included in print version) *Insider tips to get around like a local, avoid trouble spots and be safe on the road - local driving rules, parking, toll roads *Essential info at your fingertips - hours of operation, phone numbers, websites, prices, Italian road signs key *Honest reviews for all budgets - eating, sleeping, sight-seeing, hidden gems that most guidebooks miss *Useful features - including Driving Problem Buster, Detours, and Link Your Trip *Covers Rome, Venice, Pompeii, Dolomites, Cinque Terre, Florence, Amalfi Coast, Lake Como, Valle d'Aosta, Tuscany, Milan, Piedmont, Italian Riviera, Abruzzo, Umbria, Emilia-Romagna, Naples, Puglia, Sardinia, Sicily and more The Perfect Choice: Lonely Planet's Italy's Best Trips is perfect for exploring Italy via the road and discovering sights that are moreaccessible by car. * Planning an Italian trip sans a car? Lonely Planet's Italy guide, our most comprehensive guide to Italy is perfect for exploring both top sights and lesser-known gems. Looking for just Italy's highlights? Check out Discover Italy, a photo-rich guide to the country's most popular attractions. * Looking for a guide focused on a specific Italian city? Check out Lonely Planet's Rome guide, Florence & Tuscany guide, and Venice & the Veneto guide for a comprehensive look at all that these cities have to offer, or Pocket Rome, a handy-sized guide focused on the can't-miss sights for a quick trip. There's More in Store for You: * See more of Europe's picturesque country sides and have a richer, more authentic experience by exploring Europe by car with Lonely Planet's European Best Trips guides to France and Ireland. Or start with our FREE SAMPLER 'Europe's Best Trips: 3 Amazing Road Trips,' with excerpts from each guide to help you pick which region to explore first. * Also, check out Lonely Planet's USA Best Trips guides to USA, California, New England, Southwest USA, New York & the Mid-Atlantic, Florida & the South, and The Pacific Northwest and our FREE SAMPLER 'USA's Best Trips: 7 Amazing Road Trips' for more road trip inspiration. Authors: Written and researched by Lonely Planet, Paula Hardy, Duncan Garwood and Robert Landon. About Lonely Planet: Since 1973, Lonely Planet has become the world's leading travel media company with guidebooks to every destination, an award-winning website, mobile and digital travel products, and a dedicated traveller community. Lonely Planet covers must-see spots but also enables curious travellers to get off beaten paths to understand more of the culture of the places in which they find themselves.